This was worth every penny and we thought it was a good deal. Thick and heavy; doesn't look or feel cheap -- this is a bonafide quilt. Colors pop, great patterns, really eye-catching. I love pulling it up over me every night. Assembled from a captivating mix of contemporary and retro fabrics, the colorful Bohemian Dream quilt set delivers authentic patchwork styling. Featuring colors of brown, red, light blue, pink and green, this set reverses to coordinating decorative stripe. The quilt is oversized for better coverage on today’s deeper mattresses. It is prewashed, preshrunk and has a 100-percent cotton face and back with a 100-percent cotton fill. It is machine quilted with fabric bound edges for durability and surface interest. My favorite bedding set yet! Despite paying a little more than I wanted, even with it being on sale, I had to have this set when I saw it! I simply love quilts because of how light they are to sleep under and we live in GA where it hardly gets cold enough to ever wear a sweater. Colors are true to online and have nothing negative to say about it! This quilt set is gorgeous! The colors are so vibrant. I love the weight of the quilt - not too hot for Texas weather. And two cute accent pillows!! Love this quilt set! Very bohemian and washes nicely. Nice, well made, heavy duty COTTON quilt. I don't like the feeling of all the latest greatest materials made in today's blankets /quilts. I you only like the feel of cotton, like I do, this is the quilt for you. Would highly recommend. But with confidence. This quilt was exactly what I was looking for. I wanted a cotton quilt that was soft, not stiff, and would lay nicely and wanted to add some fun color to my room. This did the trick, it feels really great to sleep under and is light enough to use even in the summer months here in TX. Would definitely look at this brand again when I'm in the market for another quilt. This is a very nice quilt. It well made and looks very nice on my bed. It is a nice length on both sides and the bottom. The colors are bright. The accent pillows and shams are nice to have also. You get what you see on the computer. Great shabby chic look. In my opinion., not very heavy perfect for layering. Best option to buy with the pillows, so you can "complete" the look of your room. Lots of colors would go with this quilt. 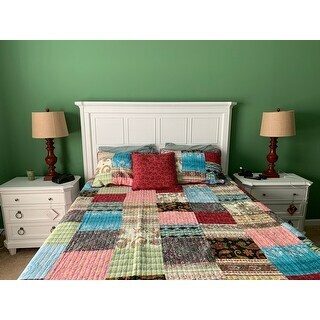 i absolutely love this quilt, it is woderfully made, the quality is amazing, great product, and i defintely would recommend. This bed cover and pillows are very high quality being very thick (heavy) and beautiful colors. Would not hesitate to buy another if we needed one. Great quilt. Beautiful colors. Great quality. Perfect! Just what I wanted and just as described! Looks awesome on my antique bed! I love Greenland Home quilts. I have ordered several over the years. They wash nicely. It’s the perfect weight for these hot southern summers and the colors are nice and vibrant. It blends well with the prexisting curtains and accents pieces. I’ve washed it at least 10 times and the stitching has remained intact and withstands the dog jumping up to lay in “her”bed. "There are 2 additional pillows shown in the photo: turquoise and burgundy. Do you carry these pillows online? How can I purchase these also? Thanks!" Unfortunately, the pillows are not sold separately. Birthday present for my Mom.